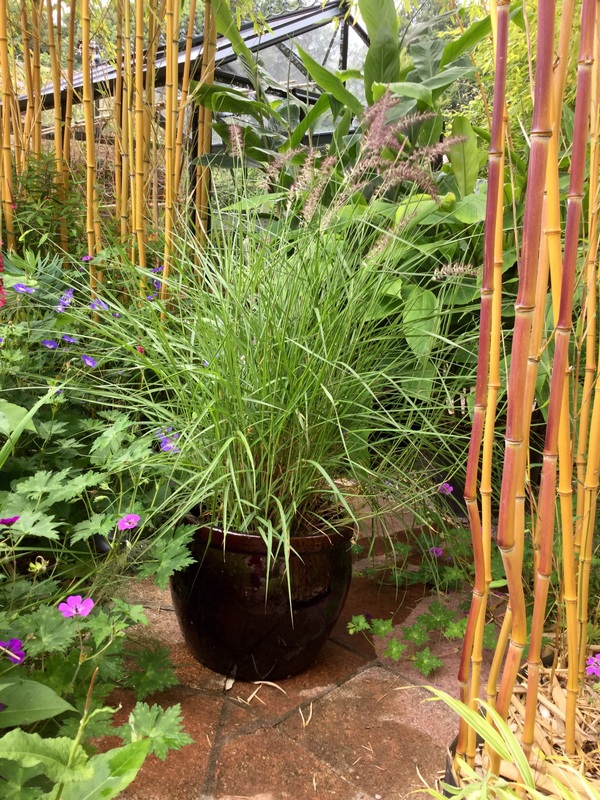 Of all the beautiful ornamental grasses that I grow Pennisetum orientale melts the most hearts. Hands of all ages shoot out to brush the feathery inflorescences sometimes accompanied by a wistful “I want one!”. And, in turn, my heart goes out to them and I’m pleased to hand over a spare one albeit with my fingers crossed. 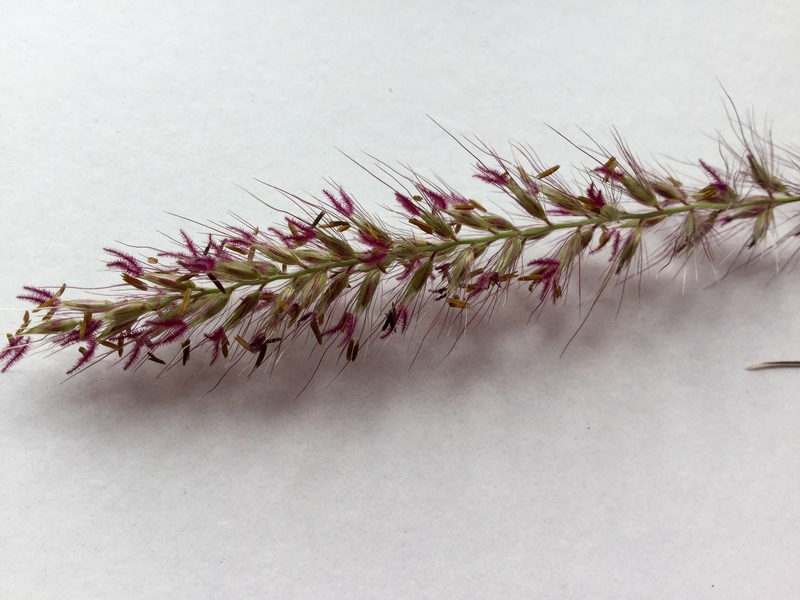 The quest to find the perfect cultivar of Pennisetum orientale happy to grow on our heavy clay soil on a windswept site at ground level has had its ups and downs. 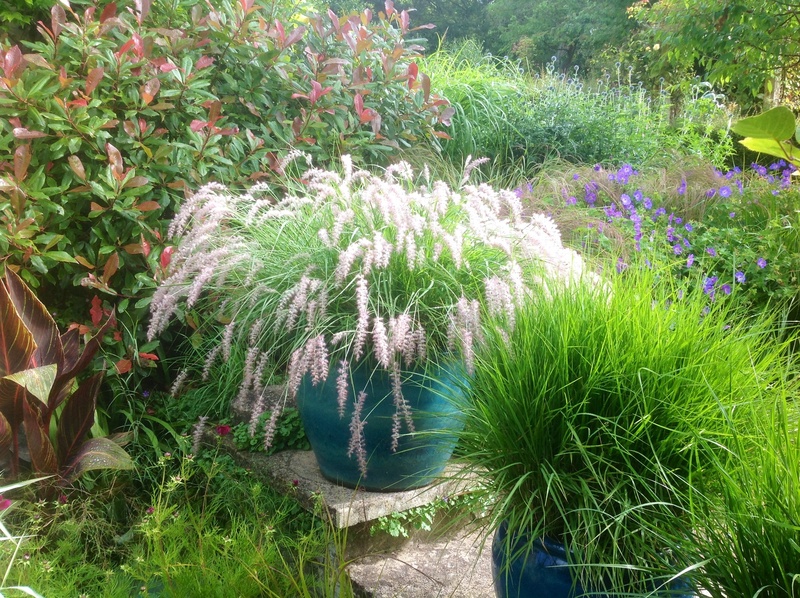 I’d nearly given up, potted them up and switched to more robust Pennisetum alopecuroides and Pennsietum macrourum. Both are gorgeous and useful additions to my garden, yet, just not quite what this middle-aged Goldilocks had in mind. When I heard about a new Californian cultivar the quest was resumed. 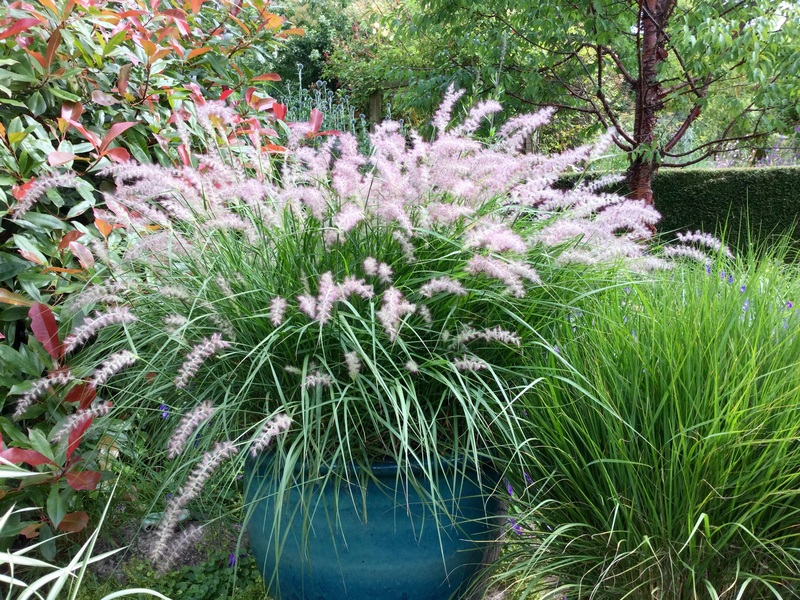 Pennisetum orientale is where it all began, thanks to its slightly glaucous foliage held in a characteristic fountain shape topped with a halo of pale pink flowers. The three growing in the big blue pot on the terrace steps form a mound about 12″ tall. It’s happily at home here, but, where originally planted to line a path the plants ended up looking bedraggled. I first saw it planted at Kiftsgate Court in a sheltered, free draining spot edging a path in the rose garden. It was a fine summer’s day in late June, so it was looking its best. Of course, I came home with three to try in a very different garden. On a sunny day, it’s an alluring sight. Following a spell of heavy rain, this is the same plant enjoying a charming summertime sigh from on high. Three times I’ve tried to grow it in borders and three times it’s been moved : out of the wind, out of the rain, out of the way of passing feet. Perhaps in a less busy garden this wouldn’t be an issue, left to dry in peace it does recover its poise. But here with many paws to consider, only a pot filled with the grittiest loam based compost seems to please this perfect princess of a grass. … but looks a little less poised on a windy one. 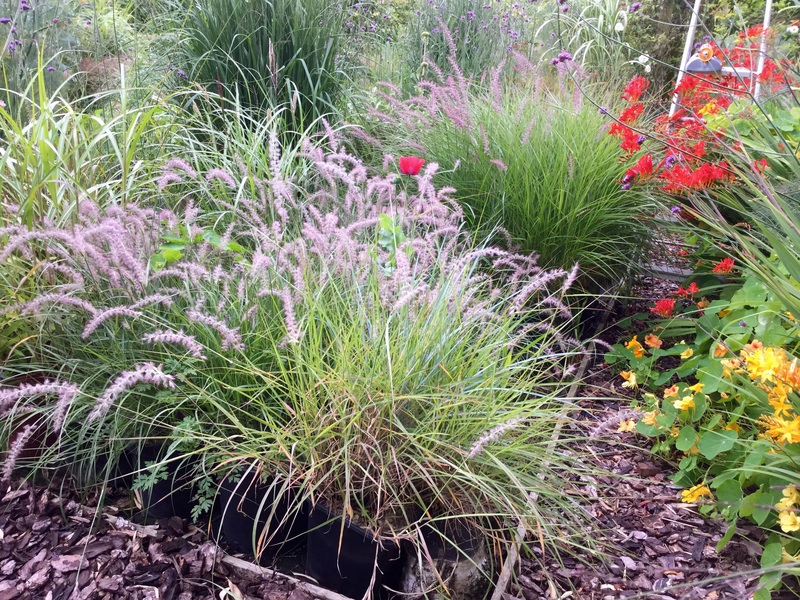 Meanhwile, there are a large number of Pennisetum orientale basking in the nursery – the darker form (background centre) is ‘Karley Rose’ at just over 3′ in height, the paler one is Pennisetum orientale, these are 18″ in height (foreground). I’d planned to add them to the summer display of patio pots, as I’ve done in previous years. But I know that moving them now, in full flower, would cause them to flop and it seems a shame to disturb them when they’re so happily huddled together. 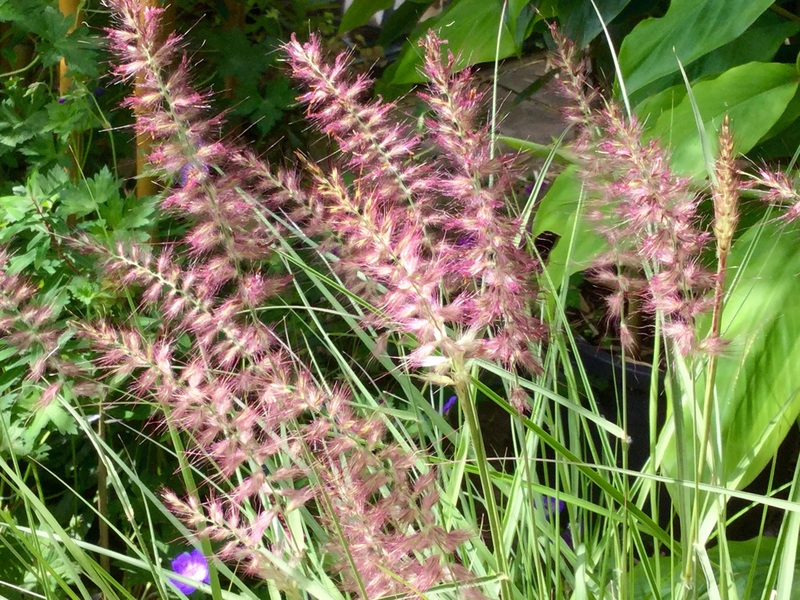 Pennisetum ‘Fairy Tails’ is where my quest to find the perfect pennisetum has ended. In 2001 this chance seedling was discovered at John Greenlee and Associates’ Pomona nursery in California. 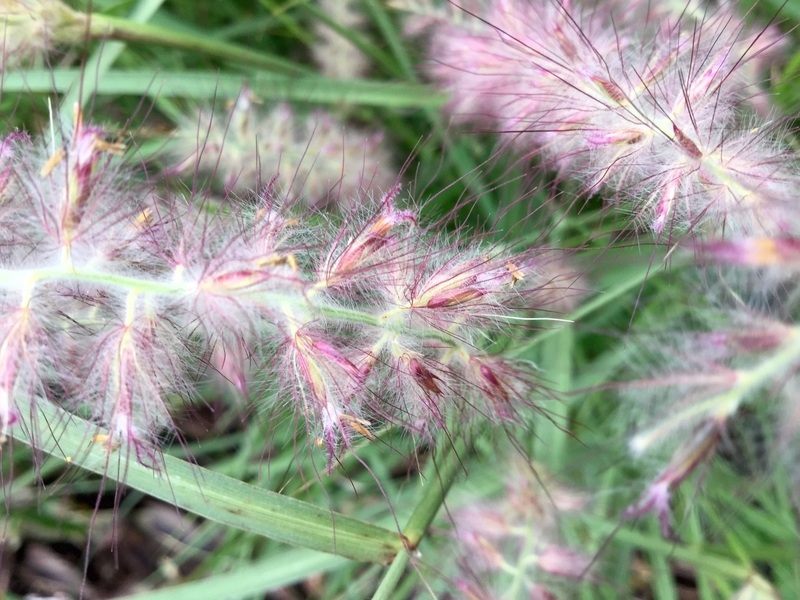 A second grass specialist, Neil Lucas, of Knoll Gardens’ fame, introduced Pennisetum ‘Fairy Tails’ to the UK market several years ago. Listening to him singing its praises on Gardener’s World last autumn had me jumping up and down on the sofa in agreement. Having grown P.’Fairy Tails’ in pots for the last few years, with no winter protection, I’ve been impressed. 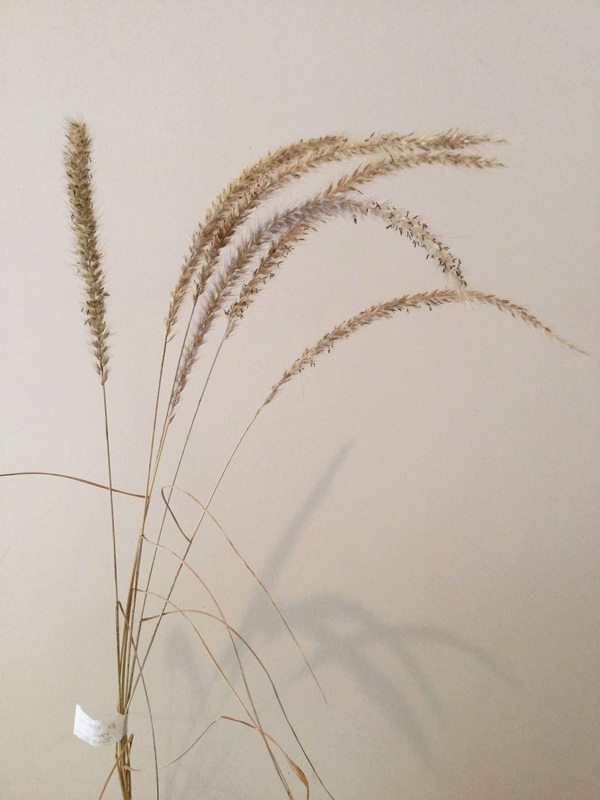 Sitting down to draft this journal entry has had me scouring references to the nomenclature of Pennisetum ‘Fairy Tails’ and the ambiguity surrounding its specific epithet has had me scratching my head. It’s variously attributed as ‘incomptum’, ‘orientale’ and ‘alopecuroides’. The former looks possible but I’m sure someone knows more about it than do I. Although I’m no botanist, it seems that where there’s uncertainty over the link to a particular species the convention is to follow the generic epithet by the cultivar name. Whatever its parentage, P. Fairy Tails’ strikes me as being just right with its pale and whispy racemes. 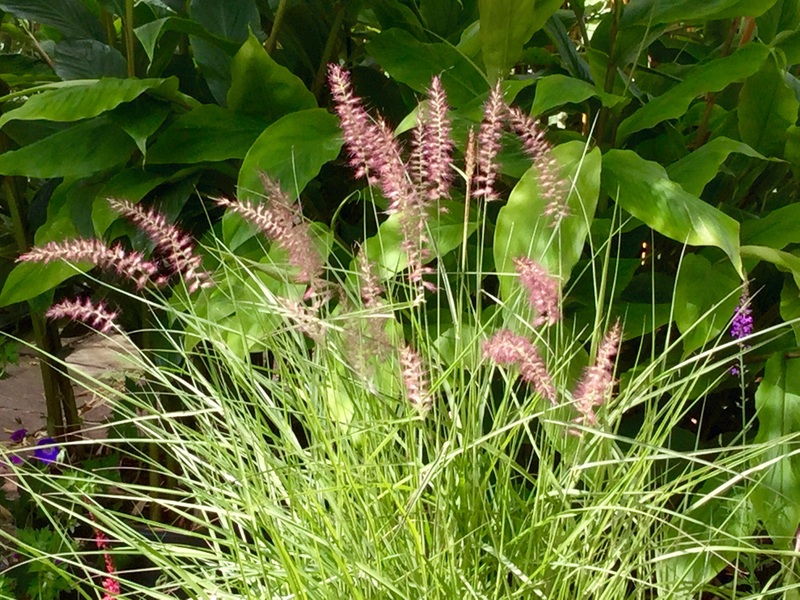 For this garden, it’s a perfect alternative to Pennisetum orientale. Even if it flowers a few weeks later than its cousins, from mid July, I’m unconcerned. In early August there are plenty of racemes to come and more than enough time for them to put on a good show. 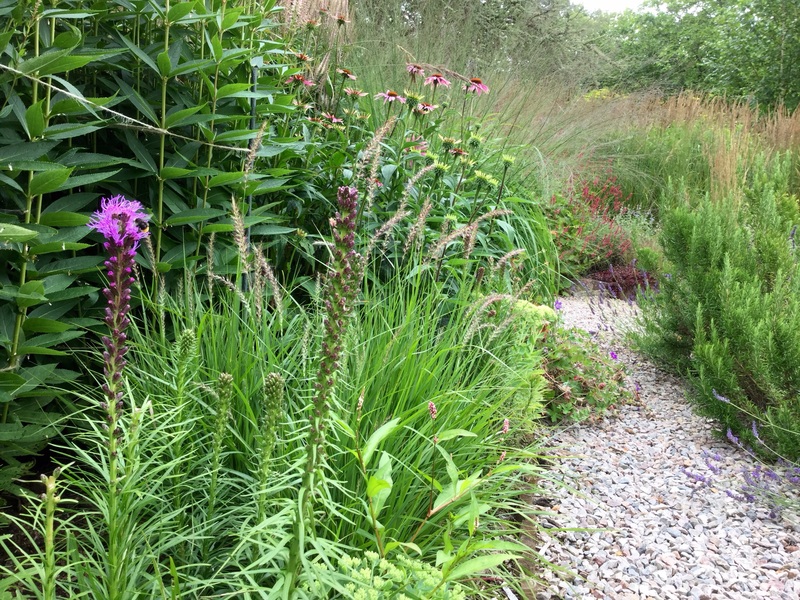 Upright come wind or come rain, Pennisetum ‘Fairy Tails’ has rekindled a vision of graceful pennisetum lining a path, forming a low hedge or as an airy addition to a mixed border – without fear of flopping. As they age, the inflorescences bleach and elongate to assume a winsome tapering habit, hence the punning name. It’s early days, but I hope the dried flowers of P.’Fairy Tails’, like these picked last year will look good and stand well among the echinacea and sedums right through the winter to give the fairy tale a happy ending. I can’t tell you how many different pennisetum I’ve planted and lost in my garden. They always remind me of little furry animals. Maybe I should try again, yours are looking lovely and I see there are many more introductions. I have a feeling my failures coincided with the run of three or four very cold winters we had a few years ago but perhaps if I planted it in a pot it would survive! You are right about the free-draining soil, the best clump I know is on chalk at Polesden Lacey and comes back year after year. Living in a cold, wet spot in not-quite-Wales my heart goes out to you! And, indeed, the inflorescences are so animal like that it feels extra bad when the plants fail! 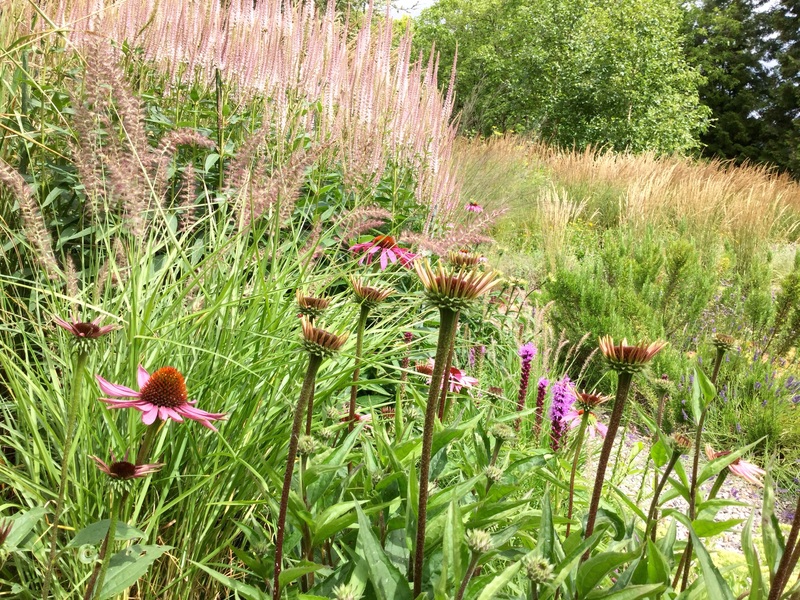 However, there are so many other pennistuems/methods to try out even in poorer conditions that can make all the difference … Ground grown in our garden Pennisetum alopecuroides is definitely one, with tried and tested cultivars like ‘Hameln’, and, though it’s early days P.’Fariy Tails’ looks like a winner. Mostly, I’ve a lost few pennistuem from planting them in what I regard as a ‘deep grave’, ensuring that the crown is kept at ground level helps, plus the liberal use of fine grit. An open sunny sight especially on heavier soils (or a big pot!) seems the place to start. Paws crossed!